An awesome amalgamation of inconsistent door hardware in the hallway behind the food court. Observant viewers will notice that the door on the right is bolted closed, providing a "jamb" for the crash bar on the left to latch against. It is interesting to note that many buildings secure exterior doors this way. 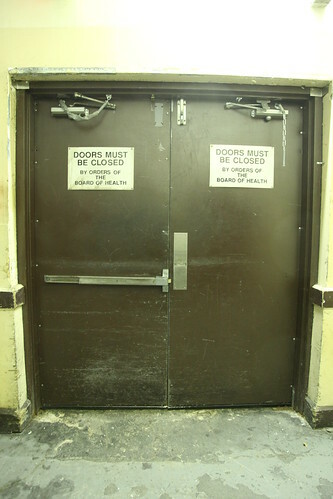 Without a way to manipulate the crash bar from the outside, this door is assumed to be secure. However, if the outside of the door lacks proper flashing, or if the bolted door provides enough "give" to provide even just a half centimeter of clearance, it is trivial to use a traveler's hook or similar door opening tool to defeat this as a "security" measure.